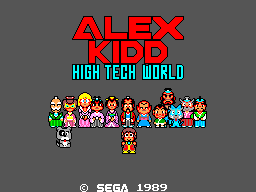 Alex Kidd: High-Tech World... Our third adventure with the Kidd. A somewhat misleading title, don't expect to go jumping and punching and fending off imaginative baddies in High-Tech World, no. High-Tech World is an arcade Alex must reach so he can play his favorite Sega Games. First he'll have to find all the pieces of the map that show him how to get to High-Tech World, then he must find a way to sneak away from home to follow said map to said arcade, AND said map unfortunately will be leading him through forests full of Ninjas that would love to capture our Prince of Radactian and a charge a Princely (pun intended) ransom for our big-eared protagonist. But that's not all, not just ninja infested forests are between Alex and High-Tech World, but a border town in which he must have a Travel Pass to be allowed onward, and you know he doesn't just happen to have one on him, that would be too easy. Speaking of easy, wouldn't it be easier for Alex to play all these Sega Arcade games on his Sega Master System safe at home in his room? I guess once he realized that despite a good marketing campaign the only way to TRULY play arcade games would be IN the arcades and not on his SMS, and we all know a chance to play Sega arcade games are worth risking life and limb in ninja forests and a seedy border town! This game is really 2 games in one, part adventure/puzzle solving; part run & jump platformer. The Adventure scenes are where this game really shines. The first Level has you scouring your castle for 8 pieces of the map that have been hidden by your 'friend' Paul. I figure on a first time play through the castle will occupy I'd say 60-70% of your play time. You have a HUGE castle to explore, MANY people to talk to, MANY signs to read, clues to find, items to purloin, etc. In fact this game often gets put down because of this but I believe this is what makes AK-HTW realistic. You only have to find 8 map pieces and you'll have to find even less items to obtain them, but there are MANY useless & dangerous items, people and encounters to throw you off course. This is what makes the game so fun to me, the actual exploration aspect. On a first time run through you really don't know who or what to trust. So many encounters will make you think you're almost there, but then you realize it was all for naught or even if an encounter gives you game over you can't be sure whether what you did was just wrong and shouldn't be done, or if one aspect of the bigger puzzle was done wrong and it should have worked out fine otherwise. Just like life. In any other game you know that if you find a key, there's gonna be a locked door about 3 minutes later, if you find a bow & arrow then there will be some enemies you need range to attack, but in this game, you can find an item and let your mind wander as to how it'll come in handy, only to realize it's just as well you picked up a flashlight when you can't find your car keys; a flashlight is definitely a useful item, just not when you're trying to start an automobile. After finding the map pieces and finding a way to escape your overbearing parents that apparently never let you leave your home, you must travel through a ninja infested forest, this is the action/platformer aspect. 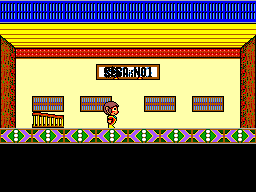 This level kinda takes you back to the standard Alex Kidd game style. After clearing the first forest which shouldn't take much more than 10 minutes you reach the border town the other roughly 40% of the game, back to adventure and puzzle solving once again as you muster up a Travel Pass to be allowed to cross through this town onto wherever High-Tech World is. However this time you're not looking for 8 map pieces, your just looking for 1 travel pass and the area you explore is nowhere near as big as the castle, but a lot more varied to explore. There's colorful locals to talk to, a fast food joint, book store, pawn shop, townhouse, temple, etc. PLUS unlike the map pieces there's more than one way to obtain said travel pass, however there's even more ways to obtain the dreaded Game Over screen, but once again like the castle it's about trial and error learning who to trust and what's useful and whats rubbish. Given it's limitation in size and multiple ways of success the border town should be much easier to pass than the castle was. After that is another run & jump adventure through ninja infested forests, and just like before shouldn't take more than 10 minutes to clear. Then you're done! We get a closing shot of Alex playing his favorite Sega Arcade game, but I always wondered... how does he get home??? Will he have to find ANOTHER travel pass to get through the town again? Will he have to defend himself from the Ninjas yet again just to get home? Do I ask too many questions? The graphics are good. Everything is well detailed so you know what's what. The castle is a little repetitive with all the halls, doors looking the same. I had to draw a map of the castle when I was a kid just to keep it all straight cause every floor looks roughly the same. The forests are nice and colorful and detailed as well as the enemies. The border town is pretty nice too, much nicer than the castle. As said above you have much more variety here than in the castle, every place you go into looks very different inside and out in color, decoration & inhabitants. Unfortunately this is the one low point of the game. There's a short repetitive track for when you wander the castle halls, another for when you're in a castle's room, likewise another for wandering the town and another for when you enter a town building and few more varied ones for specific town buildings you enter, plus one for the forest scenes. None of them are very inspired or serve to enhance gameplay and sound effects are just this side of non-existent. In fact, other than obtaining an item, jumping, throwing a ninja star or dying, I can't recall any other sound effects! When you're in the castle/border town all you have to to is walk left and right and use up/down to travel stairs/ladders/doors so how could they mess that up right? Well I will agree it takes a few tries and some getting used to always go up/down stairs when you want, but after a few tries it comes pretty naturally, and it's not like there's anything chasing you, so what if it take 12-15 seconds to find the sweet spot your first few times, nothing's going to attack you while you doing this! The forest scenes add jumping and shooting to the moves list, once again, 2 actions; 2 buttons, hard to mess up. There's some tough jumps to be made, but not due to bad controls just due to VERY narrow rocks/branch your jumping to and from. Unfortunately, like any puzzle adventure game replay value is kinda low, because once you know what and where everything is, you don't forget. It's like learning to do multiplication tables hard the first time but once you now 'em, you know 'em. I wish I could blank my mind of this game and play it though like when I was kid again. This game is definitely better than it is often stated to be, but being an adventure puzzle game you have to be willing to do some trial & error and flat our exploring as opposed to walking to the right and killing whatever comes your way. As I said earlier the title is misleading, as well as the cover art. You expect to be running around a Hi-Tech looking World punching out Ninjas, but our huge fisted Kidd keeps his shellcore trained hands in his pockets and flings Ninja stars when he wishes to deal some pain (which isn't often) this time around. 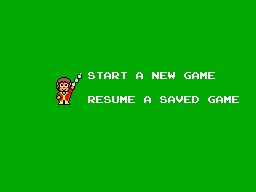 But to be fair I will say that until you know all the secrets and what's what and where this, that and the other thing is and the fact this game was meant to played in the 80's it should have kept you coming back for more and more Game Over screens until you finally figured it out. Especially if we rewind the clock to before the Internet was readily available! A good example being the school teacher Mary's test. It was this room that inspired me to create a hand drawn map of the castle so I wouldn't stumble into her room. Nowadays with Wikipedia and Google we can answer any trivia question that's thrown at us with a click of the "I'm Feelin' Lucky" button. Back then we had look stuff up in old school books and encyclopedias. And she has one question that's not in any text books, a question relating to a very high level in Space Harrier, so if you were unfamiliar with that game and none of your friends had it, you just had to guess! But once I found references to Space Harrier in a video Games magazine and I now knew the answer to her question, it was so much more satisfying then typing the question into a search engine and left-clicking. This game is definitely worth your time don't let your mind get stuck in Miracle World, no this game is NOT Miracle World, but that doesn't mean it's a bad game!